for the (heart) of stamping: Saleabrate! I had no idea it has been so long since I last posted, but I do have a good excuse... we welcomed our third daughter, Lexie Marie Jones, into our home this month! I feel incredibly blessed by my life, with my three beautiful daughters, and I love that I can stay home with them. I wish I had more time to scrapbook and make cards, but I'm sure that will come eventually! For club this month, i wanted to use some of the fun saleabration products I got for free by spending at least $60... I saw this card, and I decided to CASE it... but change it for my taste, and also for the products and colors I wanted to use. I choose to alternate patterns, though, like the card at the top, so I made 4 one way, and 4 the other. I used the sycamore street DSP, sycamore street ribbon and button pack from saleabration. Then, I used the Vine street textured impression embossing folder. The colors are from the DSP, sahara sand, pool party, island indigo, calypso coral and rich razzleberry. 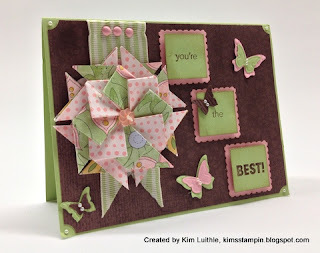 I also used the pretty petites stamp set and petite curly label punch from the saleabration catalogue. Hopefully I'll find time to post more in the future, thanks for checking in!